Berry Plastics Donates to Local Charity Food Bank | Berry Global Group, Inc. Earlier this year, Berry Plastics' employee Dave Riggs had an idea. Berry Plastics owns a vacant seven acres lot next to our Goshen, Indiana factory that has been overgrown with weeds for years. 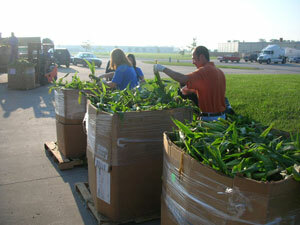 He asked Carol Marquart, HR Leader, if it would be possible to plant the lot with sweet corn to donate to the food local banks and churches who were feeding more and more unemployed families hit by the recession. Carol, Dave and the Goshen team partnered with Kercher's Sunrise Orchard and T & T Fertilizer to make Dave's idea come true.